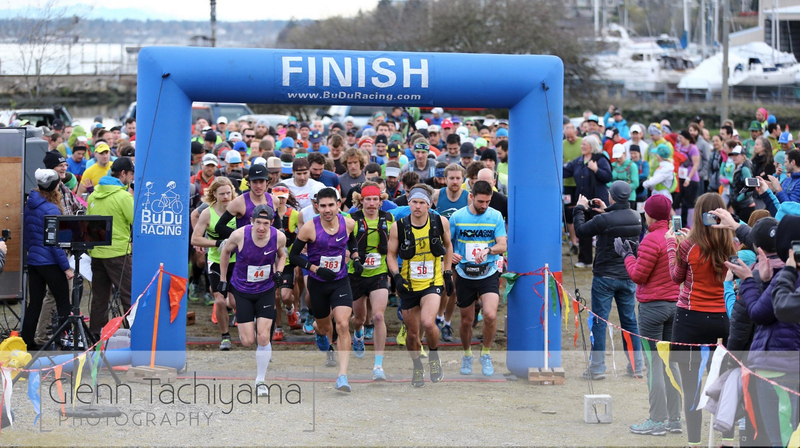 Last week, I headed to Portland for several days before swinging up to Bellingham, Washington to race the Chuckanut 50K. Chuckanut has been on my radar as one of the country's premier 50K's for years, and I always knew I'd run it one day—the timing just hadn't worked out yet. This spring, I had totally forgotten to look into it until my friend Eric Senseman mentioned he was running. I contacted Krissy and quickly decided to hop in! Coming just three weeks before Lake Sonoma 50 Mile, I figured it was the perfect tuneup with some decent climbing (for a flatlander). Coupled with the 30-mile fun run I did on Mt. LeConte in the Smokies on March 6 (with 9,000' vert! ), I'd have two 30-mile efforts and much more climbing/descending in my legs than I would sticking to the Midwest. Photos (and others below) via Glenn Tachiyama. But first, it was off to Portland for several days of hanging with friends, including the Wy'east Wolfpack: Yassine Diboun, Willie McBride, et al. (formerly Animal Athletics). I got some lovely running around town and Forest Park, though the 1,000' vert. I logged on both Wednesday and Thursday were probably slightly ill-advised for optimal race readiness. I just love the lushness of the Pacific Northwest—I'd take the ferns and greenery of Forest Park over the arid trails of Flagstaff just about any day. On Friday, Senseman and I roadtripped up to Bellingham, getting in a light shakeout run around Fairhaven followed by some drills and strides. We hit Aslan Brewing Co. for beers and pre-race dinner. It was a really chill evening and I had very few nerves about the next day (a few beers helps to calm them I find!). The race start was a very reasonable 8 a.m. (I hate when races unnecessarily start at 5 or 6 a.m.!). After an "Anutter" UGo Bar for breakfast, and a quick cup of coffee, Eric and I rolled down to the start, where we saw much of the Nike crew, including Mario Mendoza, who was a last minute entry. Along with his teammates Ryan Bak and Dan Kraft, I knew we'd have a competitive race. Race Start with Bak, Mendoza, me, Senseman, and Wolfe across the front. 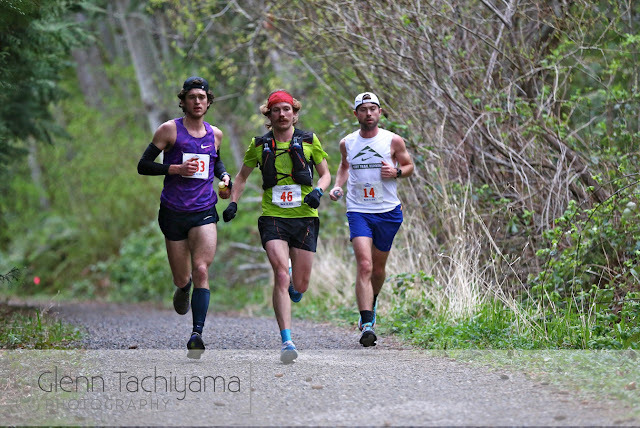 I wrote a race report for Chuckanut for the May/June issue of UltraRunning, so I won't go over everything in too much detail here. The gist of it was that Bak and Mendoza went out hard and I never saw them after the first few miles. 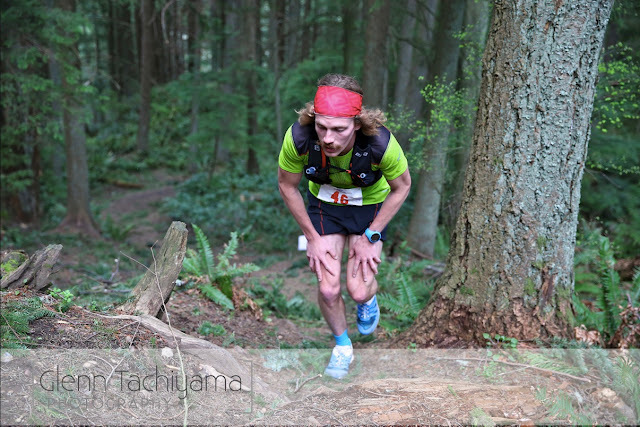 I chilled with Kraft and Nike team manager Pat Werhane for a while (usually within sight anyway) before moving into third place for good off the ridge trail just past mid-way. I felt I was moving really well the second half of the race, and my finishing time of 3:43 was objectively pretty good (just outside the All-Time Top 10), which I'm happy about. But Bak and Mendoza ran super solid times (2nd and 4th all-time), and I could never close the gap. 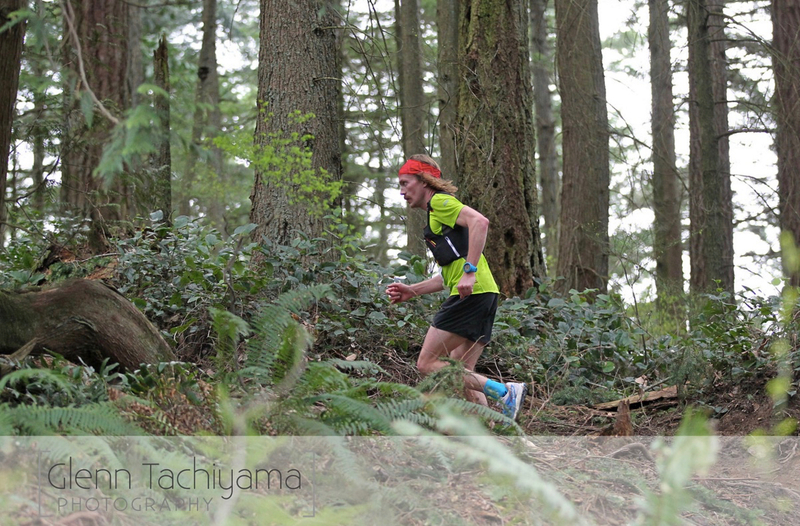 The race itself was really fun, and a nice blend of types of trail, flats and climbing/descending. As a Northwest classic, it's one I'd love to come back for. Next year is the 25th edition and I think Krissy is going to try to go pretty big to celebrate that milestone. So maybe I'll be back again in 2017! With a little experience on the course, I'd love to take a crack at sub-3:40. A-M-A-Z-I-N-G AS USUAL MATT! Congratulations! Its always great and much pleasure to see you running and participating in the races. It gives us motivation and inspires us to get ourselves ready and build our strength for racing.